In addition to the power switch often found as part of the volume, control, portable radios can have additional band switches, tone control switches, RF sensitivity controls, dial light push buttons and more. Inside a SPST slide switch. All switches have one thing in common. 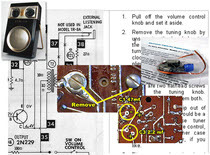 A moving metal part, or a series of metal parts which make-or-break electrical connections when the switch is manipulated. 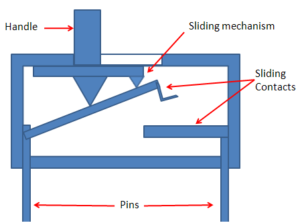 The cross-section drawing shows a simple Single Pole Single Throw slide switch. Single pole switches like this are used to turn the radio on and off by connecting and disconnecting the battery from the circuitry. More complex switches have multiple poles to switch more than one circuit simultaneously. For instance, switches in stereos that control right and left channels together are often referred to as Double Pole Single Throw (DPDT). 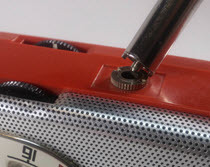 You will also sometimes find push button switches in radios. They are used for dial lights, snoozing alarms and so on. 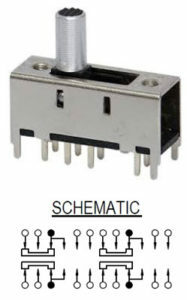 The illustration shows a typical multi-pole, multi-position switch similar to the ones used for band selection, along with a typical schematic symbol beneath it. The variety is staggering. A Sony TR-815Y, has most of these switch types, for example. Since switches are mechanical devices with moving parts they are more vulnerable to wear and damage than say, transistors or resistors. Over time dirt and corrosion collects, fowling the metal contacts and preventing good electrical connections. This renders radios intermittent or completely dead. Sometimes a squirt of contact cleaner aimed at the insides of the switch is all that takes to solve the problem. Other times nearly impossible-to-find replacement parts are needed. Complex switches are a bear to remove and replace even if you can reach them.